Does De Quervain´s syndrome always require surgical treatment? Which ointments have been proven efficient in treating tenosynovitis? Are there other options other than a surgical or injection therapy? Which drugs are usually recommended / prescribed when treating De Quervain´s Syndrome? Which effect can be expected from the cortisone injection? Does a cast immobilization make sense when treating De Quervain´s syndrome? No! In the early stage of the condition (first weeks) it is possible to conservatively treat the symptoms. Ointments as well as drugs may be helpful during this stage. If these measures do not address the problem the next step could be to prescribe a splinting therapy or recommend treatment through ointment dressings, local irradiation or injections. Ointments with an anti-inflammatory effect such as e.g. Voltaren Gel®. The active ingredient in Voltaren Gel is Diclofenac. Diclofenac is a non-steroidal drug. Diclofenac inhibits the production of the body´s neurotransmitters, e.g. prostaglandin. As a result of this inhibition many times the inflammatory response improves thus relieving the pain. Please note that Diclofenac is able to travel from the skin into the bloodstream. Patients, who were prescribed anti-clotting drugs or who suffer from stomach or duodenum ulcers should talk to their treating physician before using Diclofenac. Motion exercises performed during a warm hand bath. Regular (meaning five x five minutes daily) hand baths in warm water have been proven to be very helpful. Stretch and bend your fingers and the thumb in the warm water – or just move your hand in the warm water in a playful fashion (as a child would do). You may also add some curd soap, soft soap or Kamillosan Liquid into the pleasantly warm water. It is highly effective to apply Voltaren Gel® right after performing a hand bath. Give the ointment a good five minutes to get completely absorbed into the skin. If there is swelling and severe pain it may be appropriate to also take anti-rheumatics such as Voltaren®, Ibuprofen®, or similar drugs. De Quervain´s syndrome: the injection of a low dose of cortisone is administered close to the first extensor compartment. Please note that the cortisone injection does not come without risk as well! Even if infections or damages to the extensor tendons of the thumb are not very frequent. Both, the cortisone induced infection as well as the rupture of the extensor tendon represent a very serious complication in proportion to the otherwise not so strenuous measure. It is best to decide together with your trusted physician which would be the more suitable option, the cortisone injection or the surgical approach. This decision should be made on an individual basis. The image to the left shows a cortisone injection administered close to the thumb saddle joint. 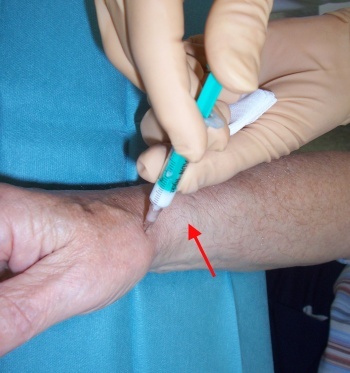 When administering a cortisone injection in connection with De Quervain´s syndrome, the needle is placed about two centimeters further towards the body (the red arrow points to the site). Just a small part of the drug seen in the syringe will ultimately be injected close to the first extensor compartment (not into the extensor tendons!). In some cases the pain and the swelling disappear completely within few days. In many cases however the therapy result is not long-lasting and the injection therapy has to be repeated. It is important to know that the number of injections administered with this therapy should never exceed three in total as otherwise there is an increased risk of damaging the extensor tendons of the thumb! 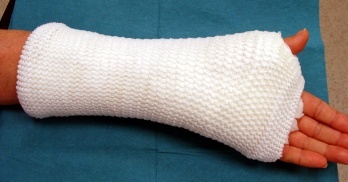 A cast immobilization makes sense if the patient is experiencing severe pain. In that case, the cast splint is particularly efficient if the immobilization also restricts the mobility of the thumb (see image). Under no circumstances should the cast apply any pressure as that would only lead to a worsening of the symptoms!